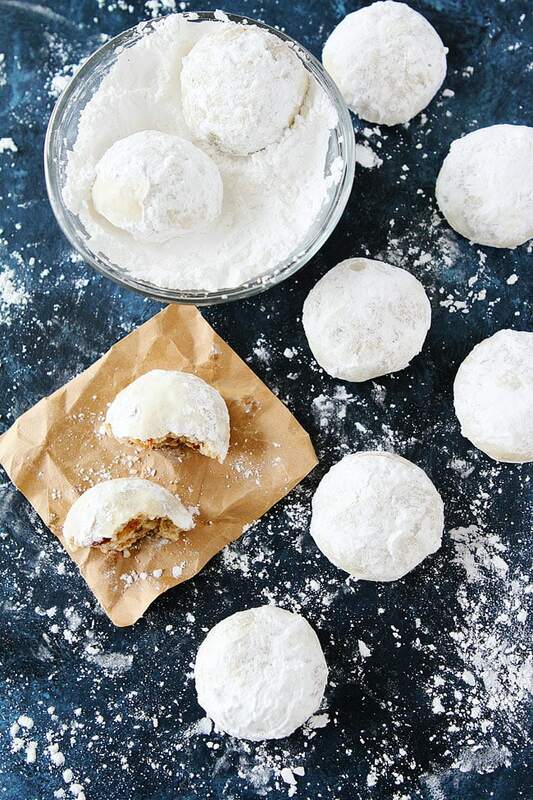 Mexican Wedding Cookies are buttery pecan cookies rolled in confectioners sugar, making them look just like snowballs. They are the perfect Christmas cookie, add them to your holiday baking list this year. Mexican Wedding Cookies are a Christmas cookie favorite, but there are SO many different names for these little buttery pecan cookies. What do you call them? I call them Mexican Wedding Cookies because that is what my family calls them. To be honest though, when I was little I didn’t really like them. I always went for the snickerdoodles, gingersnaps, and chocolate chip cookies instead. BUT now, I LOVE these cookies, because I have found the BEST Mexican Wedding Cookie recipe EVER! You want to know my secret ingredient? It is a game changer! You HAVE to try this recipe! I spotted the recipe in The Perfect Cookie, which is on my Cookbook Gift Guide for this year. It is a cookbook ALL about cookies so you know I love it! Well, the Mexican Wedding Cookie recipe is fantastic and I made it even better by adding my secret ingredient…CANDIED PECANS. I tried the cookies right away and yep, best idea ever! I used half regular pecans and half candied pecans and I am telling you these Mexican Wedding Cookies are hands down the BEST Mexican Wedding Cookies in the history of all Mexican Wedding Cookies, snowballs, Russian tea cakes, pecan balls, sand tarts, and southern pecan balls…whatever you want to call them, they are the BEST! The candied pecans add a little extra sweetness with a hint of cinnamon and brown sugar and that extra candied pecan crunch is SO good! The cookies are buttery, crisp, and they melt in your mouth! They are the perfect holiday cookie. I use half pecans and half candied pecans. You can use all pecans or even walnuts, but I think the pecan/candied pecan ratio is the best. There are equal amounts of nuts and flour in this recipe so you can really taste the pecans. Grind half of the pecans in a food processor so the nuts can release their natural oil. This will help hold the cookies together and the cookies won’t be dry. Chop the other half of the nuts so you get the perfect texture and nut crunch. 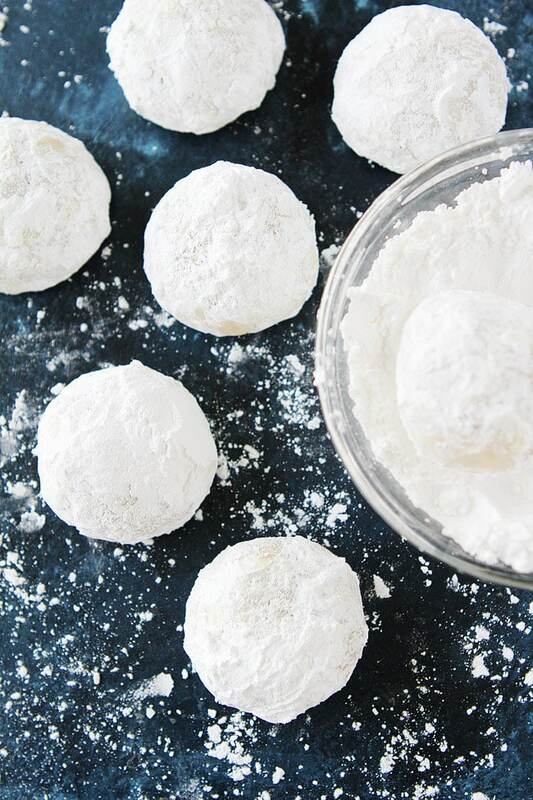 Roll the cookies in confectioners’ sugar twice to make sure the cookies are well coated. You can freeze these cookies. Defrost and roll in confectioners’ sugar again before serving. 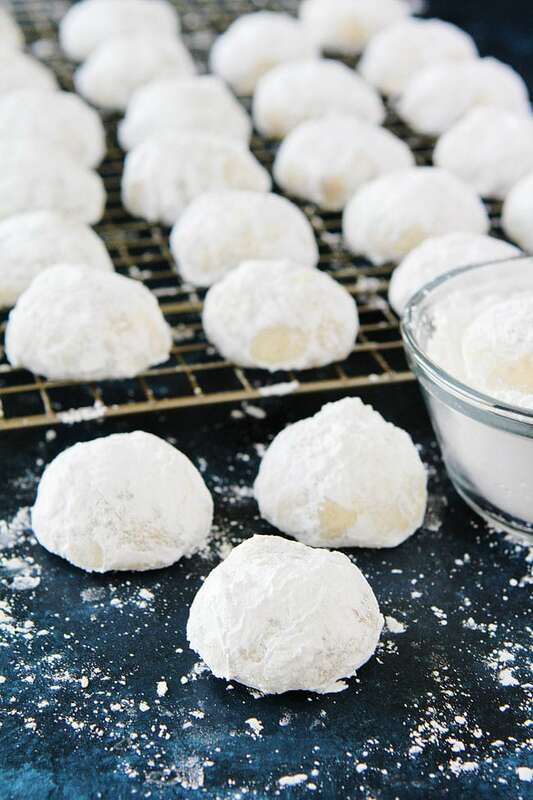 Mexican Wedding Cookies are a classic Christmas cookie and I promise you that this is the best Mexican Wedding Cookie recipe out there. Make these pretty and delicate cookies a holiday tradition! Click to download 10 Favorite Christmas Cookies Guide! Mexican Wedding Cookies are the perfect Christmas cookie, add them to your holiday baking list this year and every year! Preheat the oven to 325 degrees F. Line two baking sheets with parchment paper or a Silpat baking mat. Set aside. Place 1 cup pecans (plain pecans) in a food processor and process for about 15 seconds or until the texture is similar to coarse cornmeal. Transfer the pecans to a medium bowl. Place the candied pecans, if using, in the food processor and process until coarsely chopped, about 10 seconds. Add the chopped pecans to the bowl with the ground pecans. Stir the flour and salt into the pecans. Set aside. In the bowl of a stand mixer, beat the butter and sugar at medium speed with the beater blade until fluff, about 3 minutes. Beat in the vanilla extract. Reduce the speed to low and slowly add in the nut mixture. Mix until combined, about 30 seconds. Scrape down the bowl with a spatula and mix until the dough comes together. Give the dough a final stir by hand to mix in any remaining flour. Roll the cookie dough into balls, about 1 tablespoon of dough per cookie. Place the balls on the prepared baking sheets, spacing them 1 inch apart. Bake for 18 minutes or until cookies are pale golden and the bottoms are beginning to brown. Remove from the oven and let the cookies cool on the baking sheet for 5 minutes. Transfer to a cooling rack and cool completely. 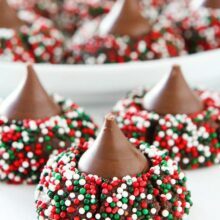 Pour confectioner's sugar in a small bowl and roll the cookies in the sugar until the are well coated. Before serving, reroll cookies in sugar and gently shake off the excess sugar. Notes-you can use just regular pecans, but I love using half candied pecans. They are SO good in these cookies. You can also use walnuts if you wish. To make super fine sugar, place the sugar in the food processor and process for about 30 seconds. I roll them in powdered sugar when they are still warm. The sugar melts some and then when they are completely cool, I roll them again in the powdered sugar. It sticks to the cookie better due to the melting from the roll in sugar while warm. But definitely agree they need to be rolled twice. Russian Tea Cakes (what we always called them) look a little sad when only rolled in powdered sugar once. Whatever you call them, they are delicious! Love the use of candied pecans. So smart! I will try that next time for sure! Whatever the name, these are a Christmas must! These are an all time favorite! I just love all of that powdered sugar! Have been making these more than 50 years. 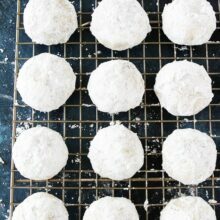 I’ve always made Mexican Wedding Cookies (Snowballs) during the holidays. I’ve also always used the handwritten recipe from my mother’s college ruled spiral note book/recipe book. This year, I tried these. I must say, the candied pecans really add depth and a nice crunchy crunch to an already delicious cookie. I’m in the process of rewriting my mother’s ‘cookbook’ into my own college ruled note book. 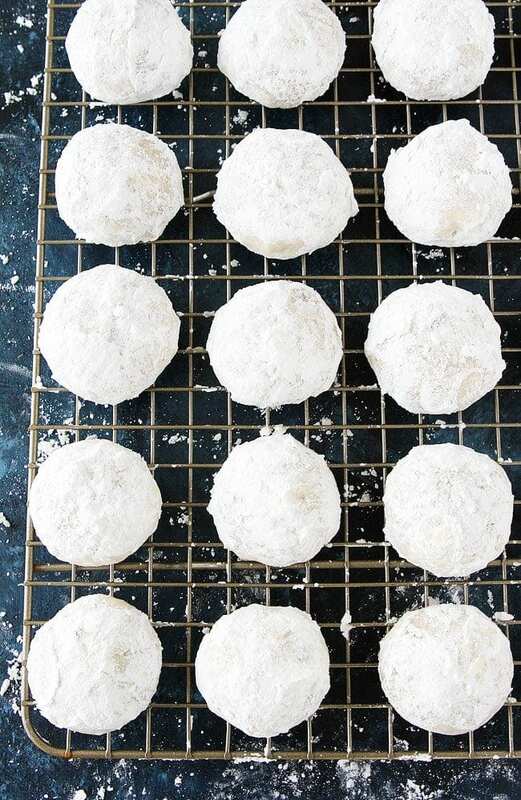 Adding some of my own, removing some of hers….These Mexican Wedding Cookie have made the cut and will be the new ‘Snowballs’. p.s. I’ve found that rolling the cookies in powdered sugar before and after baking helps the sugar from being absorbed as much…. So happy you loved this recipe! Thanks for sharing! Yep, genius. I’ve made something very similar for years & people go wild about them–the main reason is that other recipes have H A L F the nuts. B o r i n g. But this with half candied pecans does sound even better than mine. Bravo! Will try soon. Thanks for being brilliant! Did you over bake them? They have never burned or been dry for me…and I just made two batches yesterday! 🙂 Sorry you had issues! Just wondering what to do with the superfine sugar–did I miss where it’s used in the recipe? 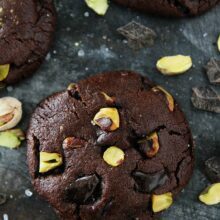 Really this would be special and great mexican wedding cookies! Love healthy food! I would add honey to it! Thanks for sharing! I’m ashamed to say that I’ve never had Mexican wedding cookies! This recipe looks great though so hopefully that will change! Thanks for posting it! Send me more yummy recipes please! 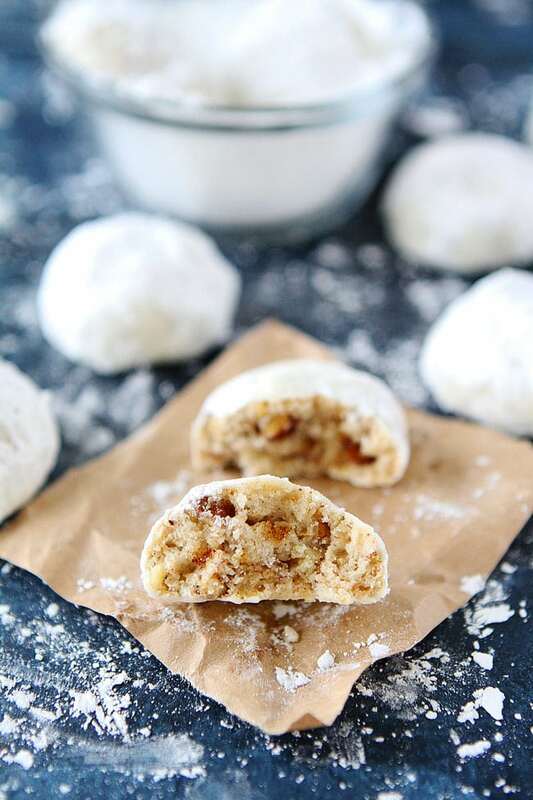 My favorite Holiday Cookies are Mexican Wedding Cookies, so I can’t wait to try your take on them with Candied Pecans. 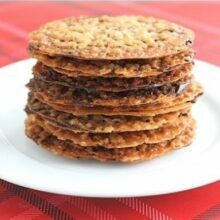 Want to try these cookies, are they a crisp cookie, or more like a tender butter cookie? I didn’t get 42 with my batch but 24 about a ping pong ball size. Nevertheless that is less for me to eat as they go down too easy like popcorn. 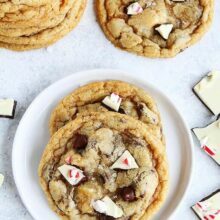 Perfect cookie for everyday sharing during cold winter months!